In the fine tradition of Grimm Fairy Tales and Slovenly Peter, childrens stories designed to scare kids into behaving, there is Krampus. Lore tells us that Santa is accompanied by Krampus, who is the one who leaves coal or switches for bad children. 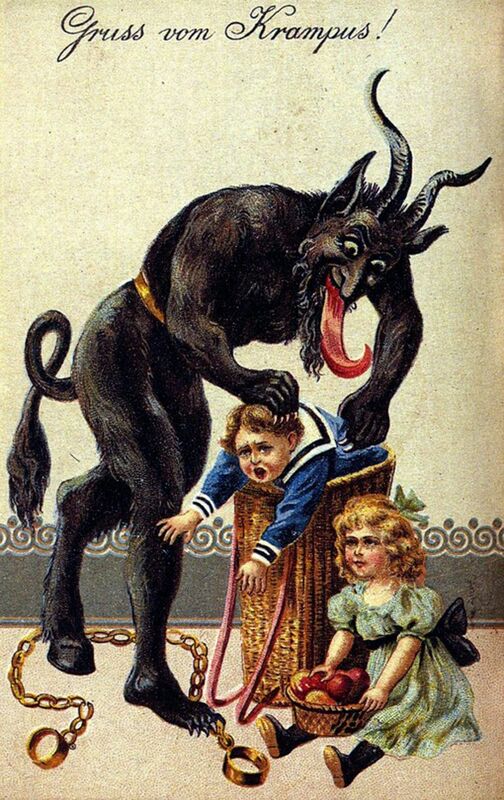 To amp it up, Krampus may carry away very bad children in his bag. Now there’s motivation to behave! In some parts of Germany and Austria Krampus Day is celebrated by dressing up as Krampus and walking from house to house asking for drinks – an adult Halloween-like celebration usually held on December 5th.